Develop, build, debug and deploy native applications for Android, the world's most popular operating system, using Microsoft Visual Studio, the world’s most popular integrated development environment. NVIDIA® Nsight™ Tegra®, Visual Studio Edition brings the raw development power and efficiency of Microsoft Visual Studio to Android, giving you the right tools for the job. Flexible project management, accelerated compilation and integrated debugging, no need to massage makefiles and shell scripts, no voodoo magic or arcane incantations required. "Epic's use of Nsight Tegra has been crucial for the efficient development of Unreal Engine 4's Android features. We're delighted to see CodeWorks for Android extend support beyond Tegra so Unreal Engine developers can remain in their favorite authoring tools during all development scenarios. NVIDIA's tool advancements are refining Android to a level matching game console development." 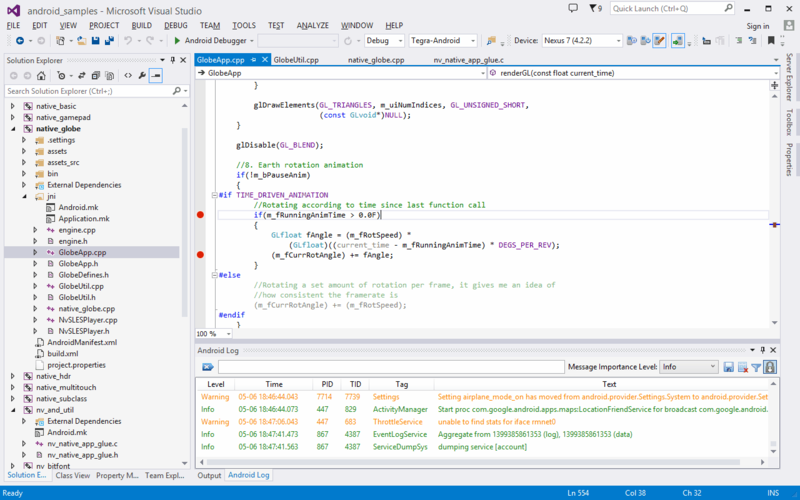 "Nsight Tegra Visual Studio Edition is our favorite tool for Android development. It enables our developers to stay in a single environment and focus on the speed, performance, and fun rather than toolchains, makefiles, and headaches. We've used it for years." "Porting a Playstation 4 game to Android with GDB and printf debugging was painful, but I nearly pooped myself with excitement there when I first saw NVIDIA Nsight Tegra natively build and debug in Visual Studio just like when the game was originally developed!" Download the latest version of NVIDIA Nsight Tegra, Visual Studio Edition in CodeWorks for Android. Nsight Tegra, Visual Studio Edition is offered free of charge, but requires NVIDIA Registered Developer Program membership. Highlights for previous releases can be found here. 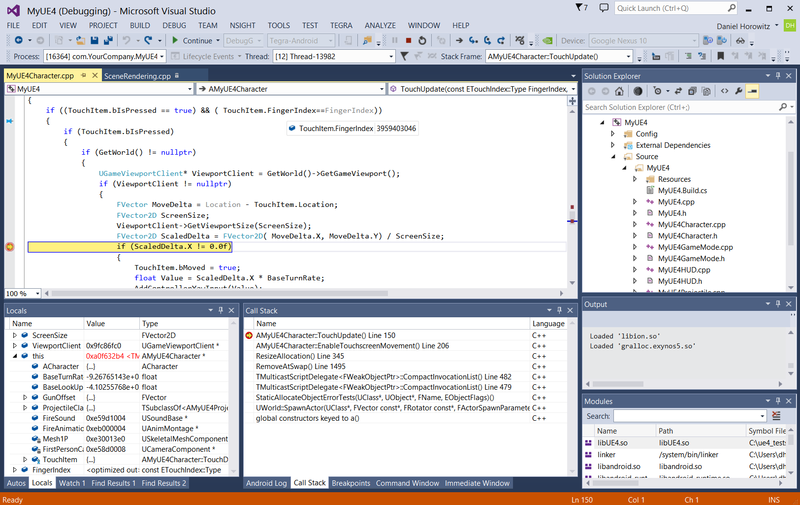 Import existing Android projects into Visual Studio. Manage native Android projects natively in Visual Studio. Build native Android projects in Visual Studio using vs-android, ndk-build or makefiles. Per-project and per-file parallel compilation. Multi-core native Android GDB debugging. Seamlessly debug Java and native C/C++ code. Use the familiar Visual Studio Locals, Watches, Memory and Thread windows. 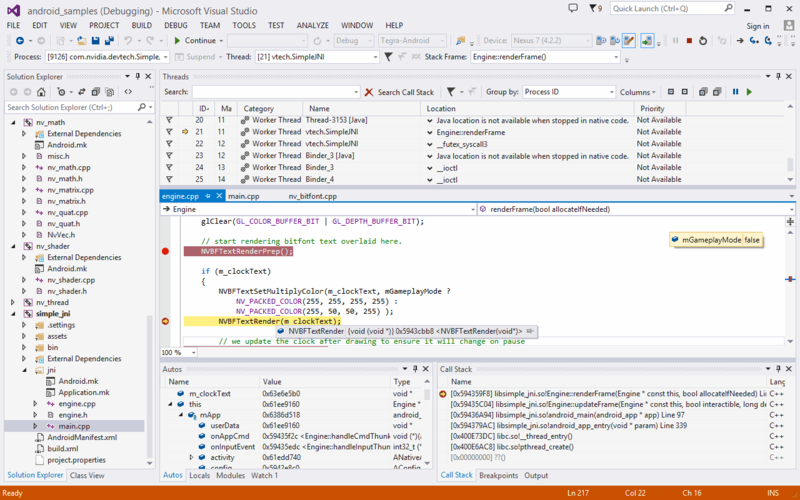 Android-specific debugging features (such as logcat) integrated into Visual Studio. IncrediBuild 5.5 and higher support allowing distributed builds (from Nsight Tegra v1.6 onwards).